Definition at line 421 of file llinventorybridge.h. 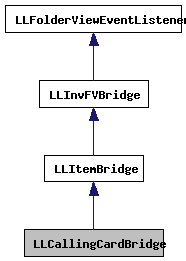 Definition at line 2613 of file llinventorybridge.cpp. References LLAvatarTracker::addObserver(), LLAvatarTracker::instance(), and mObserver. Definition at line 2620 of file llinventorybridge.cpp. References LLAvatarTracker::instance(), mObserver, and LLAvatarTracker::removeObserver(). Definition at line 2695 of file llinventorybridge.cpp. References gAgent, LLInvFVBridge::getClipboardEntries(), LLInventoryItem::getCreatorUUID(), LLAgent::getID(), LLItemBridge::getItem(), hideContextEntries(), LLAvatarTracker::instance(), LLAvatarTracker::isBuddyOnline(), LLInvFVBridge::isInTrash(), LLInvFVBridge::isItemRemovable(), lldebugs, llendl, and LLUUID::null. Definition at line 2740 of file llinventorybridge.cpp. References LLPermissions::allowOperationBy(), DAD_ANIMATION, DAD_BODYPART, DAD_CATEGORY, DAD_CLOTHING, DAD_GESTURE, DAD_LANDMARK, DAD_NOTECARD, DAD_OBJECT, DAD_SCRIPT, DAD_SOUND, DAD_TEXTURE, FALSE, gAgent, LLInventoryModel::getCategory(), LLInventoryItem::getCreatorUUID(), LLAgent::getID(), LLInventoryModel::getItem(), LLItemBridge::getItem(), LLInventoryItem::getPermissions(), LLInventoryObject::getUUID(), gInventory, LLToolDragAndDrop::giveInventory(), LLToolDragAndDrop::giveInventoryCategory(), PERM_TRANSFER, and TRUE. Definition at line 2660 of file llinventorybridge.cpp. 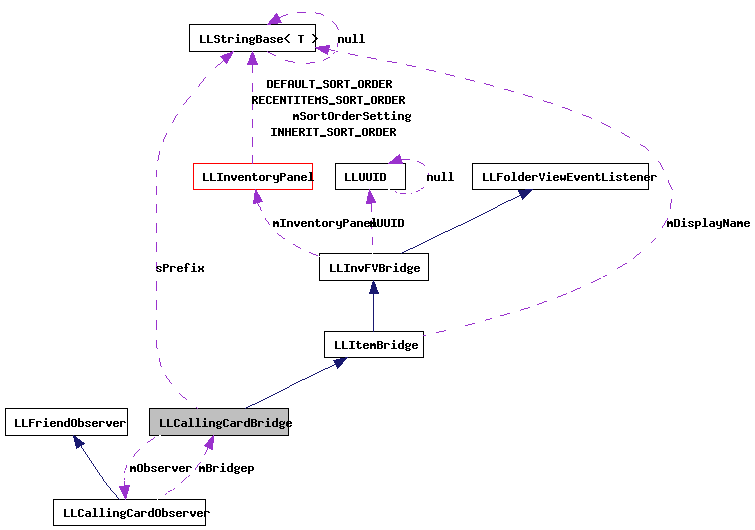 References LLAssetType::AT_CALLINGCARD, FALSE, get_item_icon(), LLInventoryItem::getCreatorUUID(), LLItemBridge::getItem(), LLAvatarTracker::instance(), LLAvatarTracker::isBuddyOnline(), and LLInventoryType::IT_CALLINGCARD. Definition at line 2671 of file llinventorybridge.cpp. References LLInventoryItem::getCreatorUUID(), LLItemBridge::getItem(), LLItemBridge::getLabelSuffix(), and LLAvatarTracker::instance(). Definition at line 425 of file llinventorybridge.h. Definition at line 2684 of file llinventorybridge.cpp. References LLInventoryItem::getCreatorUUID(), LLItemBridge::getItem(), LLAvatarTracker::instance(), LLAvatarTracker::isBuddyOnline(), LLUUID::isNull(), and LLFloaterAvatarInfo::showFromFriend(). Definition at line 2636 of file llinventorybridge.cpp. References LLIMMgr::addSession(), gAgent, LLInventoryItem::getCreatorUUID(), LLAgent::getID(), LLItemBridge::getItem(), LLInventoryObject::getName(), gIMMgr, handle_lure(), IM_NOTHING_SPECIAL, LLUUID::isNull(), LLItemBridge::performAction(), LLIMMgr::setFloaterOpen(), and TRUE. Definition at line 2626 of file llinventorybridge.cpp. References LLFolderView::getItemByID(), LLInventoryPanel::getRootFolder(), LLInvFVBridge::mInventoryPanel, LLInvFVBridge::mUUID, and LLFolderViewItem::refresh(). Definition at line 423 of file llinventorybridge.h. Definition at line 446 of file llinventorybridge.h. Referenced by LLCallingCardBridge(), and ~LLCallingCardBridge(). Definition at line 445 of file llinventorybridge.h.